Orbital debris is becoming a larger problem every day, and has adverse effects on both the cost and safety of space missions. 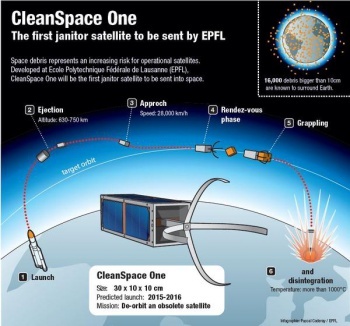 To help clean up the mess, a team of Swiss researchers have announced the planned launch of CleanSpaceOne, a satellite which will hunt down junk and gobble it up. Our planet's upper atmosphere is a mess, and it's about time we cleaned it up. The Earth is surrounded by layers of orbiting space debris, and not only do we have few ways to keep track of it all, but until now, there has been no tangible effort to clean things up. That all changes thanks to researchers from Switzerland's Ã‰cole polytechnique fÃ©dÃ©rale de Lausanne (EPFL), who are taking a big step towards sweeping the junk out of our skies. Their proposed methods will remind nostalgic gamers of popular ectovore, Pac-Man. EPFL has announced their plans to launch a "de-orbiting satellite," a device that will hunt down smaller, de-commissioned satellites, swallow them whole using a conical "mouth", and then fall back down to Earth, burning up on re-entry. Ok, let's be fair, that last part sounds more like an obnoxious Kirby move in Smash Bros. This is not the first announcement this year of a plan to deal with space junk. With luck, CleanSpaceOne will launch by 2018. The project is estimated to cost about 10 million Swiss francs (a little over 10 million US dollars), but this is not going to be a one-shot deal. EPFL hopes to develop a family of like devices, capable of "eating" various sizes of space junk, and selling them to national space agencies. Because each such satellite is designed to destroy itself, part of the project's goal is to make its construction as sustainable as possible. Space junk is an enormous problem and it is a relief to know that researchers are taking a proactive approach to it. The trash is composed mainly of decommissioned abandoned satellites, spent rocket stages, and broken bits of spacecraft. Each of these are, in turn, orbiting the Earth at unimaginably high speeds, and collisions are not only frequent but devastating. In-use satellites can be knocked out of orbit or demolished altogether by an unpredictable bit of shrapnel the size of a thumbnail, and the same can happen to manned missions. Thankfully this has never occurred, but that hasn't stopped us from imagining how it would go down. The International Space Station has to make occasional adjustments to its own orbit in order to avoid collisions. NASA currently tracks about 16,000 of these objects that are larger than 10cm in diamter. Thanks to the high-speed collisions, however, the amount of relatively-"dust-like" debris is exponentially greater than that There is no technology yet that can track these smaller "bullets" of trash. The space junk problem has even been parodied in Futurama and Pixar's Wall-E.
An even greater threat to humanity's continued growth, however, is the tragic behavior known as Kirbycide. How can we end this madness? Is cleaning up Earth's exosphere worthwhile, if we end up resorting to such deplorable tactics?